Hello everyone I am new here been a fan of Nanoha and Fate since I first found out about them and well this is my first try at doing a story based on the 2. Not sure if my portrayal of them will be what people expect but I wanted to present the couple in a different manner I hope people enjoy it. Thanks to Divine Vengeance who beta read my story and corrected my horrible English. Nanoha sighed as she looked at the other side of the bed, wishing it wasn't empty. Looking at her clock, she realized that it was already midnight. “Where is she?” Reaching over to her bedside table she grasped Raging Heart and concentrated as she called to Fate. Raging Heart began to glow as it projected an image of the blonde. Nanoha sighed as she slumped into bed and wrapped the covers around her, crying softly and eventually drifting off into sleep. As the hour of her alarm turned to 7 AM, it started to make an annoying beeping noise. Yawning, Nanoha slowly woke up and turned off the alarm. Making her way to the bathroom, she heard some footsteps. Fate slowly pulled back, moving her hand under Nanoha's cheek as she wiped away her tears before pulling close and kissing her gently on the lips. Fate started to reach out, seeing her partner in tears and pain, but before she could speak she saw Vivio come out of her room. Vivio smiled as she ran over to Fate, giving her a big hug. “Fate-mama, you’re home! 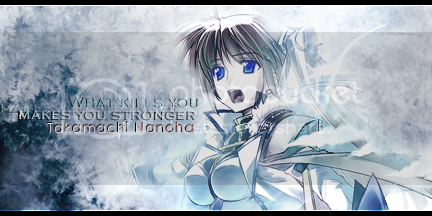 We missed you, right, Nanoha-mama? Nanoha forced a smile. “Right. I'll make us all some breakfast.” Looking down, she moved to the kitchen quickly, biting her lip to try to stay calm. Raising her left arm, Fate touched Bardiche as it materialised a ring box. Grabbing the box with her other hand she slowly opened it. Inside was a white gold ring with a small red and a matching yellow gem interlaced with white gold decoration. Before Fate could respond, Nanoha's voice echoed through the hall. “Breakfast is ready.” Sighing slightly, she gently patted Vivio's head before heading to the dining table. As she sat down, Nanoha forced a smile making her feel anxious. Vivio soon joined both her mothers, but it was a quiet breakfast with a heavy air of tension. Tears started to flow as Fate waited for her family to get ready. She headed to the bathroom to get cleaned up and wash away her tears, not wanting to upset Vivio. After Vivio entered school, Fate turned to Nanoha quickly. “I know I have not been home as of late, but I promise I will be at home more soon, I promise.” She reached her hand out to Nanoha, but the brunette shied away. Nanoha looked at her partner. Feeling so conflicted, she wanted so much to express her true feelings, but the pain of their relationship overwhelmed her. “You keep saying that, but nothing has changed. We have been together for over a year, and I have seen you for only about a month of it.” Fuming, Nanoha wanted nothing more than to say “I love you,” but she felt trapped under the weight of her pain as she turned away and ran. Fate looked on as she watched Nanoha run off. She froze on the spot for a moment, not sure what to do at first, but the one thing she knew was that she didn't want to let Nanoha go as she started to chase after her. Nice start, it's a bit sad to see both of them suffering, but what a surprise it'll be for Nanoha ! Good start, hope to read more from you soon. Are you posting this in fanfiction.net as well? Thank you for all your comments I had a few problems on what to include in the second part in the end i cut out some ideas mostly because I wanted to keep to the theme of the story. This time I have proof read it I will admit that I am not brilliant with grammar as I seem to have a mental block with it. Tried my best to make it read well and hope I have done an ok job. Thanks again and hope you like the end hope its not to short. The rain dripped of Nanoha's hair as she turned to Fate slowly, feeling confused by her emotions wanting so badly to say how she truly felt but shackled by the pain of her heart. She pressed close to Fate as she let out a loud cry all her pain flowing out as she started to gently hit Fates chest in pain and frustration. Reaching her hand out to her loves face Fate gently wiped away some tears before pulling closer pressing her lips softly against Nanoha's, she gently cupped the brunettes cheek with her free hand as she kissed her the other one now grasping Nanoha's hand firmly not wanting to let it go. The warmth of the kiss made Nanoha's heart melt the pain seeming to wash away with the rain as she softly returned the kiss not caring about anything else, other than being with her love losing all sense of time she just continued to kiss Fate wanting to make up for all the kisses she had missed. The rain continued to fall onto the pair neither caring as they continued to tightly embrace one another. Feeling happier than any other time in her life Fate slowly glided the engagement ring onto her Fiancée's trembling finger smiling she gently clenched Nanoha's hand tears running down her face. Just as she was about to speak the brunette pressed her finger onto the blonde's lips. Moving close to the brunette Fate gently placed her hand over Nanoha's “I will never leave your side because I can't bear to be without you either.” slowly pulling her love close enjoying the warmth of their embrace the two just held one another for what seemed like an eternity.